2019 will be only the sixth year that the Mangyongdae Prize International Marathon is open to foreign amateur runners. You can run the 5k, 10k, Half or Full Marathon. All four of these races take place at the same time and on the same day -- Sunday 7 April (2019) – and will be run on course which is fully recognised by both the IAAF (International Association of Athletics Federations) and AIMS (Association of International Marathons and Distance Races). Please note that all non-Korean participants are required to enter the country as part of an organised tour group. This year, the race's official travel partner is Koryo Tours, a Beijing-based, British-run company, which has been operating tours in the DPRK (North Korea) since 1993. The route is a return course run through central Pyongyang, taking in many of the iconic buildings, monuments and streets before heading out into the countryside just outside of the urban centre, before turning and running back again. The race starts and finishes inside Kim Il Sung Stadium. Each race distance will have a designated turning point at the race half distance point where runners are required to turn and head back towards Kim Il Sung stadium. All runners are invited to participate in the race’s opening ceremony, which involves a lap of Kim Il Sung Stadium before heading out onto the streets of Pyongyang. All runners then have the chance to finish their race inside Kim Il Sung stadium in front of a capacity crowd of 50,000 people. After the race has finished, the top three in the 10 km, half and full marathon amateur categories (men’s full; men’s half; men’s 10km; women’s full; women’s half; women’s 10km) take their place on the stadium’s podium for the award ceremony. It is not possible to enter the Pyongyang Marathon without being part of an organised tour group. The race's official travel partner, Koryo Tours, has a range of tours available to join to get you to Pyongyang for the marathon. The Pyongyang Marathon has, since 2014, partnered with Koryo Tours to help facilitate the sign-up process for international tourists and runners wanting to take part. Registration for 2019 — via Koryo Tours — is now open. The Pyongyang Marathon is officially open to runners with disabilities such as those using wheelchairs or visually impaired runners. If you have any special requirements, then please contact Koryo Tours who can arrange to get you to Pyongyang and entered into the race. All professional athletes are welcome to join the Pyongyang Marathon. There are cash prizes to be won, as well as a bonus for breaking the course record. The organisers require all elite athletes applying for this race to submit records of their personal best from the 36 months prior to the Pyongyang Marathon event with a copy of their CV. These documents must be received before the preliminary entry period closes on 25th January, 2019. The Organizing Committee will be happy to invite 6 male athletes and 6 female athletes (including 1 official per country), provided that the submitted personals meet the above-mentioned criteria. Elite athletes who are not selected for one of the invitational spots in the race are still welcome to join the event if they, or their associates, are able to fund their own travel and entry. You can read the 2019 Mangyongdae Prize International Marathon Official Bulletin for Elite Athletes in full by following this link. All four amateur races — the 5km, 10km, half marathon, and full marathon — will start and finish inside Kim Il Sung Stadium (including a final lap of the stadium track). This means that everyone participating will get the chance to finish in front of a 50,000-strong capacity crowd of local Koreans who will be in attendance at the stadium. 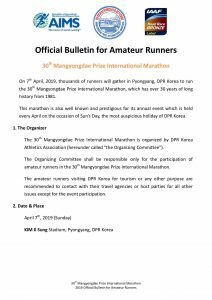 The official race bulletin for the 30th edition of the Mangyongdae Prize International Marathon – the 2019 Pyongyang Marathon – has been released by the DPR Korea Amateur Athletics Association. This official bulletin confirms important information for all amateur athletes participating in the 2019 race. 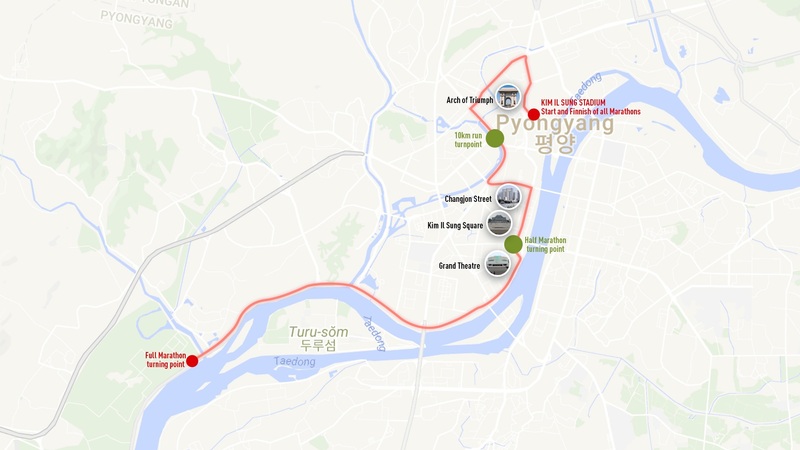 This includes that the route for the marathon will again follow the same return route introduced for the 2017 event including the very popular race start and finish inside Kim Il Sung Stadium in front of 50,000 people, and that the official full marathon race time limit is 4.5 hours. It also confirms that the race entry fee for the 5km event has decreased and for 2019 will be just $50 USD to enter. 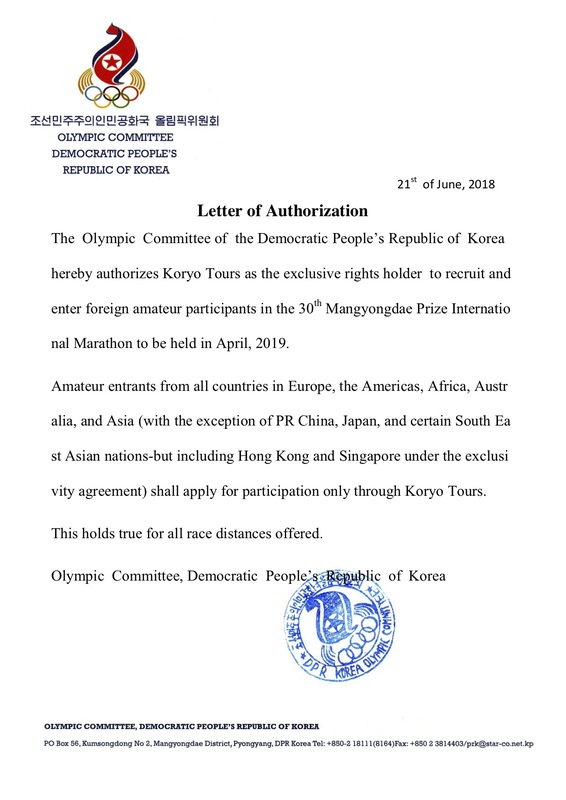 The bulletin also confirms that the organising committee continues to work with Koryo Tours as the exclusive rights holder for all amateur athletes, with the exception of runners from some south east Asian countries. This means that by traveling with Koryo Tours to get to the Pyongyang Marathon you are automatically guaranteed entry into the marathon. You can read the bulletin in full by clicking on it below. For elite athletes looking to take part in the 2019 Pyongyang Marathon, the official bulletin for the elite events has also been released – you can view it by following this link. 2019 Pyongyang Marathon is now open for applications! We’re excited to announce that the 2019 Pyongyang Marathon – also known as the Mangyongdae Prize International Marathon – is now open for applications. The event will be taking place on Sunday April 7, 2019 and will follow the same route as previous year’s with the start and finish inside Kim Il Sung Stadium in front of 50,000 people. It will also be the 30th running of the race, and we gladly invite you all to join us for this special occasion. The event’s exclusive partner Koryo Tours has prepared a range of tours of various lengths & budgets, and is offering some special early bird discounts for those that sign up early! You can view the range of tours available above. In the meantime, here is a video from 2018’s event to get you motivated! The 29th Mangyongdae Prize International Marathon – also known as the Pyongyang Marathon – was run on Sunday April 8th, 2018. In chilly conditions that saw snow falling at one point, 1,170 participants from all over the world including 429 amateurs headed to Pyongyang to hit the streets for one the most unique marathons in the world. With a time of 2:12:53, the DPRK’s very own Ri Kang Bom came in first place for the men, and current Asian Marathon Champion Kim Hye Gyong came in first for women with a 2:27:30 just edging out her twin sister Kim Hye Song who finished second with a 2:27:31. This year’s event also saw disabled athletes participate for the first time ever with William Tan from Singapore becoming the first person to complete the race in a wheelchair with a time of 2:49:59, and Kim Chol Ung from the DPRK becoming the first visually impaired runner to complete the event with a time of 3:28:20. Running in the Pyongyang Marathon is unlike any other race in the world. The crowd support is incredible, and crossing the finishing line is an extraordinary experience thanks to the 50,000 Koreans cheering you on as you make your way around Kim Il Sung stadium. However, if you are to get the most out of this event, we recommend you expand the following sections to read further about the event. If you wish to take part then the most important thing to do is ensure you’ve booked your trip to the country with an official travel provider, and have properly secured your place in the race. Koryo Tours is the official travel partner of the 2019 Pyongyang Marathon. Booking directly with Koryo automatically guarantees you race entry. When selecting which race distance to enter, please take time to properly consider the preparation you have done, and what you are physically and mentally capable of. We advise against attempting one of the longer race distances in Pyongyang if you have not done them before. Marathons are inherently dangerous, and can be an extreme test of one’s physical and mental limits — please note that there are very limited medical options available for treatment in Pyongyang should something go wrong. We strongly recommend selecting a distance you know you can do, and doing it well, because you’ll want to make this event memorable for all the right reasons, and not the wrong ones. The weather on the day of the race can vary dramatically each year, so participants will need to prepare for all possibilities. Please ensure you are wearing appropriate clothing to suit your comfort for the conditions on the day and remember to protect yourself from the sun, including applying sunscreen. An official race shirt will be provided for you to wear, or you can wear your own. Please note that shirts featuring flags, political slogans, prominent logos or obscene words are prohibited. Refreshment stations are placed every 5km along the route, but will only provide water. If you require sports drinks, energy bars, gels, or any other such snacks in order to help you get to the finishing line, then you must bring these into the country with you — as such items are not available in the DPRK — and then carry them on race day. There are no limits on how much food and drink you can bring in to the country. Pay attention to your surroundings at all times, as all race participants — including the elite athletes — will be running on the same course at the same time. Avoid getting in the way of faster runners, especially the professional field, and try not to make sudden stops or wild changes of direction. If you need to stop or change direction then communicate this in advance to those around you via hand or voice signals. If you injure yourself, or start to feel unwell, then stop your race immediately and move to the side of the road. Do not try to push through the pain or discomfort — you will only make your situation worse. Ambulances will be driving the course at all times, and will come to collect you once you have stopped. The stadium doors will close after 4 hours so that the awards ceremony can begin. The top three in the 10km, Half and Full Marathon amateur categories (men’s and women’s) will then take their place on the stadium’s podium for the award ceremony. The time limit for the Full Marathon race has, for 2019, been set at 4.5 hours. Any amateurs running the Full Marathon who cannot make the 4.5 hour cut-off time and are still on the course will be asked to stop, and their time will be recorded as a DNF. Amateurs who successfully complete their event at the Pyongyang Marathon will receive a race certificate and official finisher’s medal — these will be provided to those running any of the four race distances (but only provided you finish in time). The certificate and medal will be given to you before your departure from Pyongyang. Stay tuned for updates regarding the 2020 Pyongyang Marathon! Fill in the short form below to receive updates and information about the 2020 Pyongyang Marathon.